The Council of Educators in Landscape Architecture (CELA) has awarded Associate Professor Bart Johnson the 2014 Excellence in Research Award, Senior level. Johnson formally accepted the award at the annual CELA conference in Baltimore, Maryland, in March. While at UO, Johnson has been the principal investigator or co-principal investigator on more than $4 million in externally funded research grants. 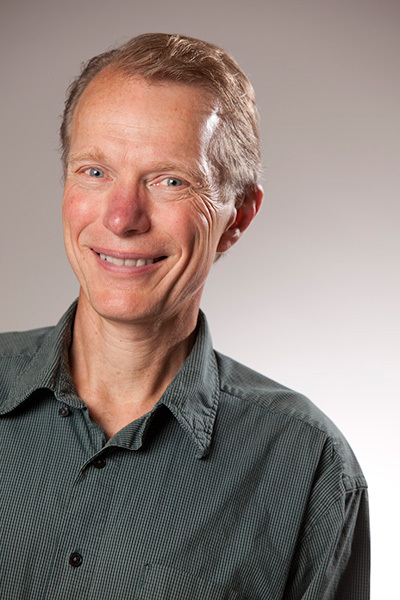 Johnson joined the UO faculty 1995, teaching courses in ecology, design, and research methods. He was also responsible for integrating ecology into both undergraduate and graduate curricula. When the Department of Landscape Architecture began a PhD program in 2005, Johnson was selected to serve as its program director, a position he held through 2011. Hulse outlined three research contributions in particular where Johnson’s work stands out: his investigations into the use of fire as a landscape management tool, his role in catalyzing efforts to bring ecology into design thinking and work, and his focus the past five years on climate change adaptation planning and design. Johnson’s recent research grants and awards include three larger projects entitled, respectively, ”A Landscape-Level Approach to Fuels Management Through Ecological Restoration: Developing a Knowledge Base for Application to Historic Oak-Pine Savanna” (2004-2008), from the U.S. Department of Interior Joint Fire Sciences Program. ”The Interactions of Climate Change, Land-Management Policies, and Forest Succession on Fire Hazard and Ecosystem Trajectories in the Wildland-Urban Interface” (2008-14), from the National Science Foundation Dynamics of Coupled Natural and Human Systems Program; and ”Climate Effects on Plant Range Distributions and Community Structure of Pacific Northwest Prairies” (2008-13), from the U.S. Department of Energy. He has received several related awards from the USDA Forest Service and National Science Foundation that build on these projects through wildfire simulation and risk reduction modeling, monitoring oak restoration outcomes, and offering research opportunities to undergraduates. He and his colleagues have a number of other research proposals and projects in the works. Chan said Johnson’s future research “is aimed at a theory of adaptive capacity in coupled human and natural systems that integrates understandings of land and water tenure, learning and self-organization in the face of global environmental change.” Johnson’s doctoral students are working on such diverse topics as the impacts of urbanization on hydrology and aquatic ecosystems under future climate change, climate change impacts on soil carbon storage in Pacific Northwest prairies, and whether beneficial airborne microbial communities may be an underlying reason for the human health benefits of urban green space, and if so, how such knowledge can be used to create more resilient urban environments. Johnson holds a PhD in ecology and a master’s in landscape architecture from the University of Georgia, as well as a bachelor’s in agronomy from Cornell University.